It is my distinct pleasure to warmly welcome you all to the Ministry of Foreign Affairs this evening. Tonight’s gathering brings together many distinguished Ambassadors and representatives of both partner countries and organizations with whom we share a common purpose: a stable, democratic and prosperous Afghanistan. Thank you for being here tonight! I do not want to make this too formal, as this reception is an opportunity for all of us to relax and reconnect, but there are a few points that I would like to share briefly about where we are now, and where we are heading, particularly regarding Afghanistan’s foreign policy, as we begin the Decade of Transformation. A year ago, there were open questions about whether Afghanistan would complete its security and political transitions without being further destabilized. I think we all can agree that Afghanistan did weather some difficult storms in this period – most notably, the challenges associated with our difficult, but ultimately successful political transition. Our people demonstrated patience and fortitude, and came together, in a spirit of unity, to protect and promote our national interests which resulted in the formation of the National Unity Government offering a strong foundation to build on our past progress and realize our future goals. The successful completion of security transition is another milestone putting the Afghan National Security Forces in the lead to provide security across the country. Although emerging from the long electoral process has made Afghan political forces more resilient, a great deal of work remains for the National Unity Government. Restoring confidence in governance, not only with Afghans but our international partners as well; applying lessons learned from the elections to institutional reforms, so that the shortcomings of the past never happen again; enhancing the capabilities of the Afghan National Security Forces; and implementing effective economic policies for the country towards becoming more self-reliant are the key focus of our work in the coming months. Beyond this, the Transformation Decade also brings with it a new phase in Afghanistan’s foreign policy, focused particularly on economic development. A key aspect of this is regional cooperation. President Ghani, CEO Dr. Abdullah, and I recognize the importance of our relationship with our immediate and extended neighbors and allies as defined within the five circles of Afghanistan’s foreign policy. We endow trust in, and goodwill to our relationships with all our neighbors, regional and international partners. We will do our utmost to enhance our friendly and effective cooperation without letting our relationship with one country overshadow our relationship with others. We are ready to explore avenues of cooperation that would bear desired outcomes collectively while respecting our national interests. In this regard, the most tangible progress we have made since the formation of the National Unity Government is in the area of regional diplomacy and global outreach. This is partly a result of the clarity of vision and policy that the leadership of the National Unity Government, and President Ghani in particular, has forged in the past few months. As we set out to achieve these objectives, we will need regional and international assistance to address the challenges we face and to fully embrace and utilize existing and emerging opportunities. Taking this opportunity, I wish to express our gratitude to all our regional and international partners for the support they have provided to Afghanistan over the past 13 years. Afghanistan’s peace and stability have direct impact on the region and beyond and the challenges we face cannot be confined to our borders nor can they be insulated or pushed into others’ backyards. Terrorism, violent extremism, drug trafficking and other forms of organized crimes as well as mass human migration, are serious threats to regional stability and international order. Overcoming these threats demand a unified and integrated response through concerted efforts and effective collaboration at both regional and international levels. We are hopeful in being able to increase the level of regional cooperation to combat these challenges, which is vital to our common success. There are opportunities in this region as well. Trade, transit, communications and energy interdependence are all opportunities which can ensure the interests of all countries in the region with the implementation of effective economic policies. Our location as a land-bridge between major economic powers offers an excellent opportunity for economic integration at both regional and international levels. Our clarity in policy and vigorous diplomatic outreach has been well-received in the region and has helped our neighbors shape their long-term vision for partnership with Afghanistan more precisely. Second: The need for consensus to forge a more unified regional position in support of these processes. One area where this consensus is beginning to take shape is, support to advance our peace and reconciliation efforts, as the priority has been highlighted in various international and regional conferences, including those held in Brussels, London, and Beijing. In this respect, we are in the process of boosting our engagement with a number of neighboring countries and other partners to achieve real and substantial progress. We are also inspired by the increased interest of the Organization of the Islamic Cooperation and its member-states, in support of the Afghan led and owned peace process. The OIC and its member-states can play an important role in the process, and its active engagement can have a significant impact given the instrumental misuse of Islamic teachings by terror groups and other insurgents. With government’s strong will particularly through the leadership of the National Unity Government, along with the changing dynamics within the region, the Islamic World, and the long standing support of the United States and other members of the international community, the prospects for peace and stability in Afghanistan grows stronger. But reaching full fruition in the process will continue to require patience and collaboration of all our regional and international partners. We are hopeful that the coming months will bring positive outcomes for Afghanistan and the wider region through the continuation of a multi-lateral diplomacy with the purpose of strengthening regional processes and sustainable international support. 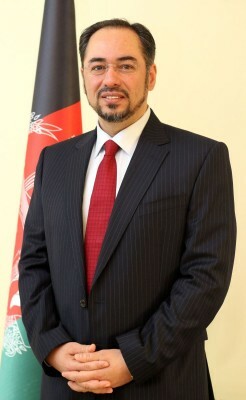 In this regard, the Afghan Ministry of Foreign Affairs will operate as proactively as possible, but we need your help. We hope you will raise with my office any outstanding issues you may have so we can address them as soon as possible, and I am confident that for the sake of close cooperation, you would coordinate outreach and engagements through the Ministry. And with that I would like to thank you all again for accepting our invitation and coming to this reception tonight.